Pediatricians gather a multitude of information, including insurance, addresses, and phone numbers. 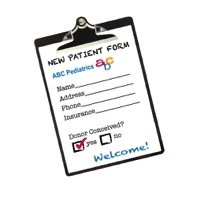 Current pediatric intake forms may also ask other questions including the type of birth, APGAR scores, immunizations, hospitalizations, blood type and formula type (even whether breast fed or not). And most importantly, doctors ask for the medical history of the child, as well as a family health history. But what if the child being treated has no access to one half of their family medical history and family tree? With this type of detail being requested, it would seem appropriate to also ask in the Family Medical History section whether a child had been donor conceived so that the caregiver could be cognizant of the fact that the child's family medical health history was only half complete. While some parents do initially receive a donor profile, which includes a self-reported medical page, this is only a snapshot of one day in the life of a young and healthy donor and may, or may not, include accurate information. Health care professionals have known for a long time that common diseases - heart disease, cancer, and diabetes - and rare diseases - like hemophilia, cystic fibrosis, and sickle cell anemia - can run in families. If one generation of a family has high blood pressure, it is not unusual for the next generation to have similarly high blood pressure. Tracing the illnesses suffered by your parents, grandparents, and other genetic relatives can help your doctor predict the disorders to which you may be at risk and take action to keep you and your family healthy. Wouldn't pediatricians want to know about a child's origins for preventive care and especially if a hard to diagnose or serious condition arose? It's time to start being more proactive in an environment of unregulated sperm banks and egg clinics, and the reproductive medicine industry in general, which has buried its proverbial head in the sand when it comes to medical disclosure. A myriad of preventable conditions, both minor and major have emerged in donor conceived infants, toddlers, children and adults (many who are in large half-sibling groups, sharing the same donor), with no regulation on the sharing of this information which is vital to the care of the resulting child. As sperm donors can father more than 150 children, a genetic condition can be passed along to many more donor conceived children than to children in a traditional family. The new egg banks may also be heading in the direction of creating many children to one single egg donor. Parents would understandably want their pediatrician to have at least a cursory view of their child's complete medical family history (or know about the lack thereof), and preferably a full genetics screening panel. And yet, the pediatricians, even in this day and age, do not routinely ask if the child is donor conceived, even with the protection of patient privacy that already exists in their practices. Within the Hippocratic Oath, which all doctors swear to, is the verbiage: "I will prevent disease whenever I can, for prevention is preferable to cure." It would seem that at the very least, the onus is on the pediatricians and children's specialty physicians to at least ask if the child is donor conceived in their simple pediatric forms, in a simple check box. Such disclosure could provide the pathway for the exchange of information and the basis for more screening and more comprehensive genetic testing, and more intelligent analysis if a condition arose which could be a result from the unknown biological parent's (donor's) genetics. Many parents who have used donors do not tell their children the truth about their conception, but disclosing this information to both the child, and the health provider, is imperative for receiving adequate medical care. Many donor-conceived people are finding only out by accident that they have been predisposed to certain conditions. In 2009 JAMA published an article about a man who passed Hypertrophic Cardiomyopathy (HCM) to many offspring via donated sperm. Of the 24 children known to be offspring of the donor, including 22 who were products of fertilization via sperm donation and 2 conceived by the donor's wife, a total of 9 genetically affected offspring, 2 to 16 years of age and 6 males, have been identified with HCM (2005-2009). Three of the 9 gene-positive children have currently expressed phenotypic evidence of HCM, including one who died at age 2 years due to progressive and unrelenting heart failure with marked hypertrophy, and also 2 survivors with extreme left ventricular hypertrophy at age 15 years. The latter 2 children and the donor are judged likely to be at increased risk for sudden death. In 2012, the NY Times reported that parents of a donor-conceived child born with Cystic Fibrosis sued their sperm bank, who claimed to test for the disease. Not quite a year ago, we heard about a story involving donor conceived adults and their own small children with Long QT syndrome, which can lead to sudden arrhythmia death syndrome (SADS). Many other diseases have also been reported by parents, offspring, and donors on the Donor Sibling Registry. Stories like these shouldn't be ignored by the medical community. Accurate numbers of donor offspring and tracking of genetic illness are both impossible to estimate in this community since sperm banks and egg clinics do not take responsibility for policing themselves in the form of maintaining accurate birth records, or even updating the medical histories of donors or sharing medical information amongst families. . The population can only be estimated, but one thing is certain, donor conceived people are becoming a significant part of the population as a percentage, and their medical needs are just as important as their traditionally conceived counterparts. The operative "don't ask, don't tell" just isn't working anymore for those conceived with donor gametes. Until pediatric primary care physicians start being proactive and requesting this medical information, along with conducting necessary genetic screenings, many donor conceived people are at risk of receiving substandard preventative care.